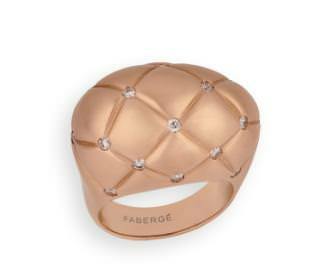 Fabergé’s Matelassé Fine Jewellery collection is a bold, contemporary collection of pendants, rings and earrings. This evocative design, with its soft, tactile and gem-set quilting, represents the perfect marriage of heritage and modernity that is so much part of the ethos of Fabergé today. Superbly sculpted and engraved, the luscious cushions of gold, white, yellow or rose gold, conjuring the cocooning warmth and texture of quilting, are studded with diamonds or multi-coloured gems. The Matelassé collection takes its inspiration from the sumptuous furnishings of the great Romanov Palaces, evoking the intimacy and comfort of Empress Alexandra’s favourite salon, the Mauve Room, in the Alexander Palace in Tsarkoe Selo. 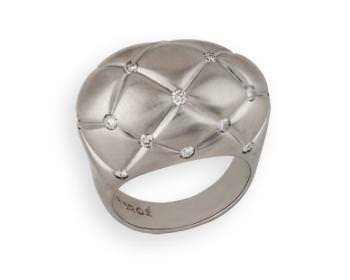 The trellis-like lines of the quilted pattern, some trailed with diamonds, recall the classical century-revival style that dominated decorative design at the turn of the century, from Paris to St Petersburg. Reminiscent of luxurious button-backed furniture, of Belle Epoque opulence, at the same time Matelassé possesses a strong fashion flair, fusing fabric and jewel, mixing nostalgia with a contemporary edge. 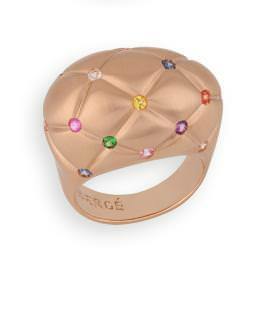 The new, directional form of the Matelassé ring is a bold, modern interpretation of the iconic Fabergé egg, smooth, sculptural and bombée, minimal yet sensual, its sleek shape contrasting with the softness of the rich pink gold cushions, studded with white diamonds or coloured gems.